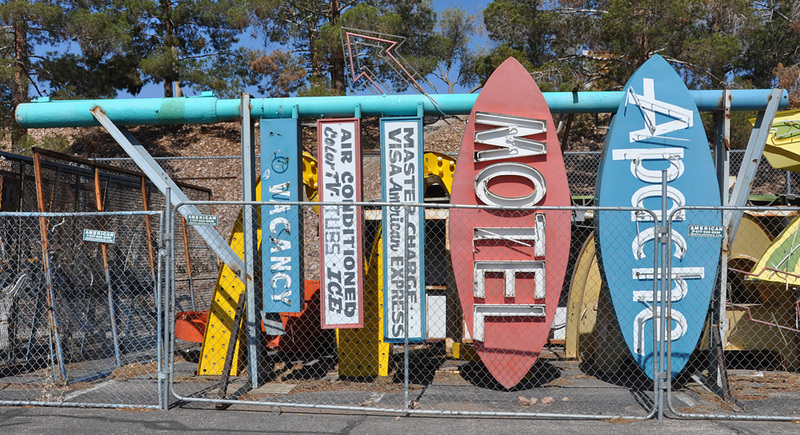 These signs are owned by The Neon Museum. They were on display near the Fremont Street Experience when these photos were taken in 2006. The signs were moved to storage for several years. 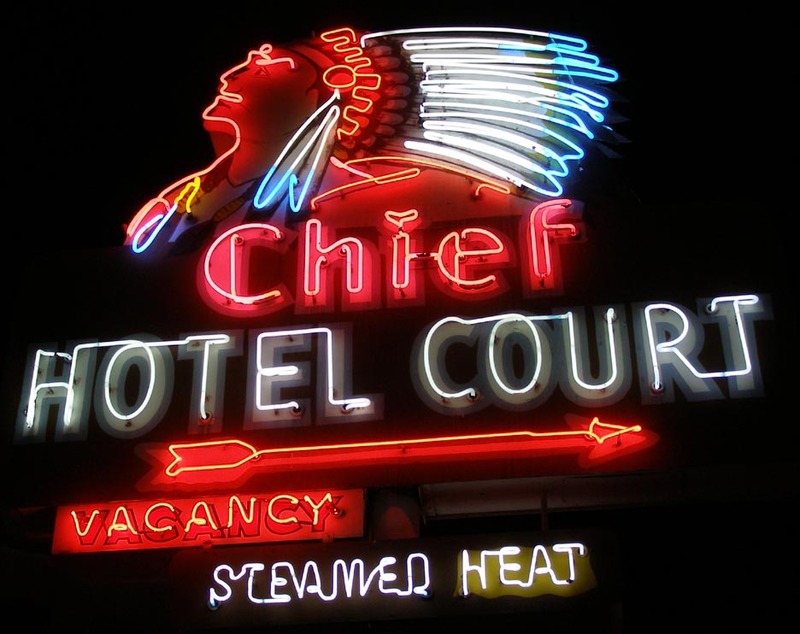 In 2018, the Andy Anderson, Red Barn, Chief Hotel Court, and some of the other signs were put on display at the Museum. The Hacienda Hotel & Casino sign was built in 1967 by YESCO. The Hacienda was demolished in 1996 for the Mandalay Bay Hotel & Casino. 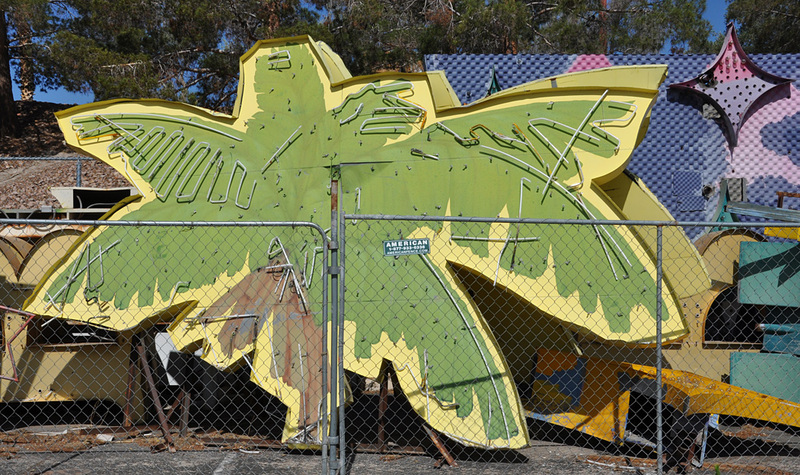 The Hacienda sign was the first installation at the Neon Museum. For more, see these websites: 1, 2, 3, and 4. The Andy Anderson sign was built by YESCO and installed on top of the new Anderson Dairy headquarters building in 1956. The sign may have been designed by Hermon Boernge. 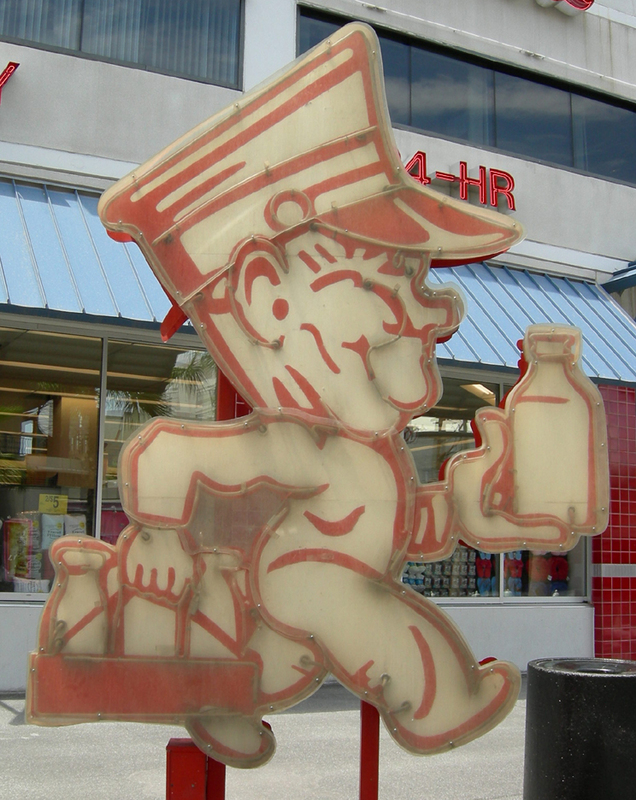 Andy was used in advertising until 1994. 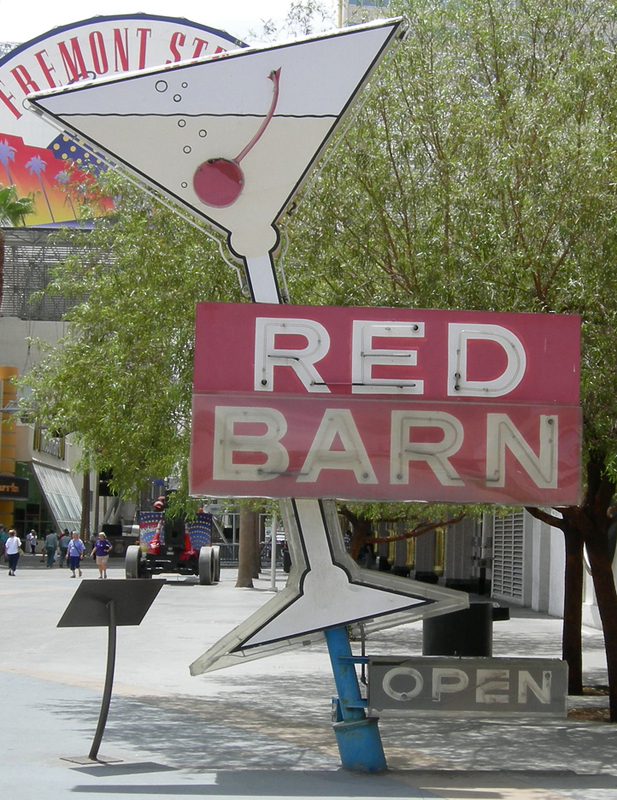 The sign was taken down in the late 1990s and restored by the Neon Museum. 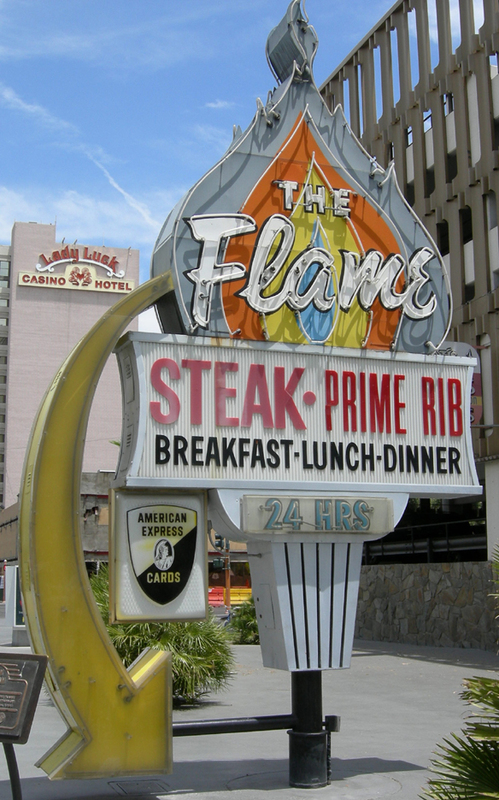 The sign was covered with plastic for protection and put on display near Fremont Street in 1997. The sign was removed around 2012 and put in storage. The sign is now on display at the Neon Museum. For more, see these websites: 1, 2, and 3. 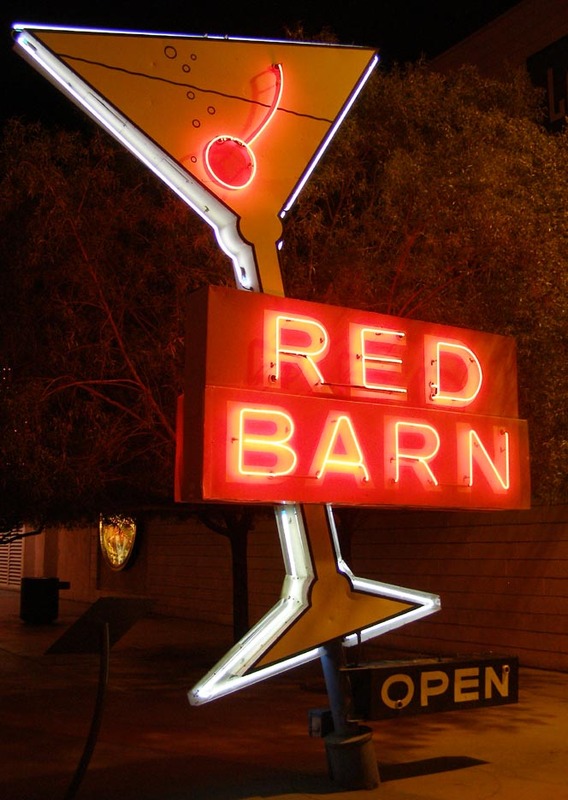 The Red Barn was established as an antiques store in 1958. In the early 1960s, the store was converted into a bar and this sign was built by YESCO. The bar closed in 1988. When the bar was destroyed by fire, the sign was saved. It was restored and put on display here in 2000. These photos are from 2006. The sign was later later moved into storage. In 2017, the sign was temporarily installed on Las Vegas Blvd. The location will feature rotating displays of signs from the museum's collection. This sign is now on display at the Neon Museum. 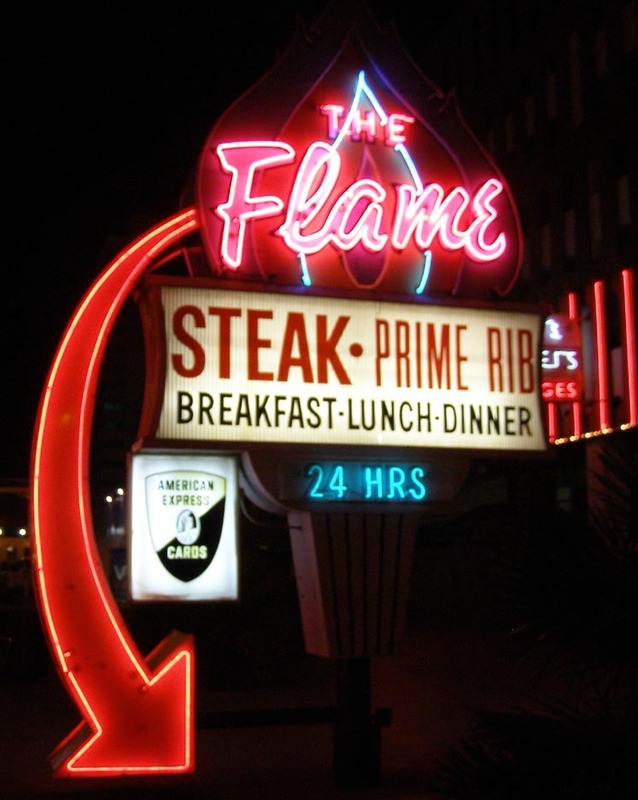 The animated Flame Restaurant rooftop sign was built by YESCO in 1961. It was restored and placed on display here in 1997. For more, see these websites: 1, 2, and 3. 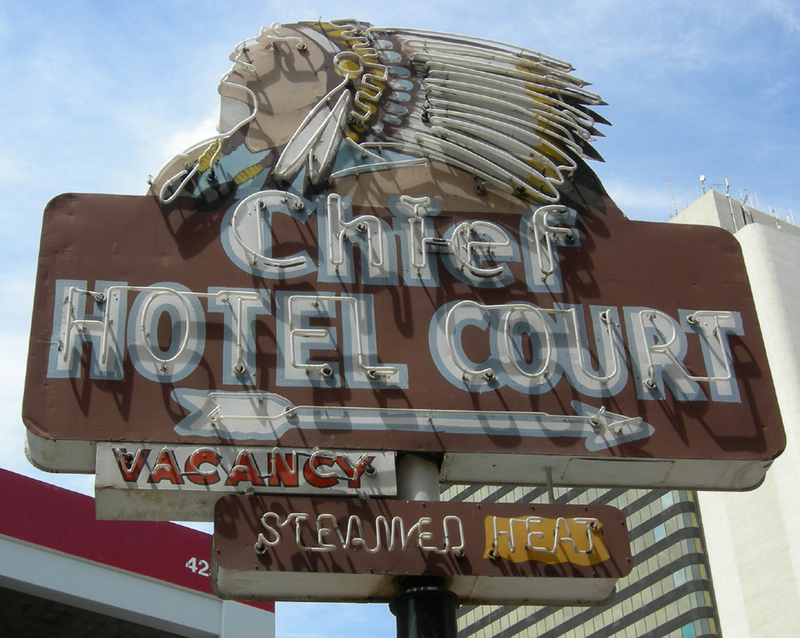 The Chief Hotel Court sign was installed at the hotel around 1940. The text originally read Chief Autel Court. Autel was a popular name for auto hotel/motel at the time. The sign was restored and installed near the Fremont Experience in 1997. It then went into storage for several years. It is now on display at the Neon Museum. For more, see this website. 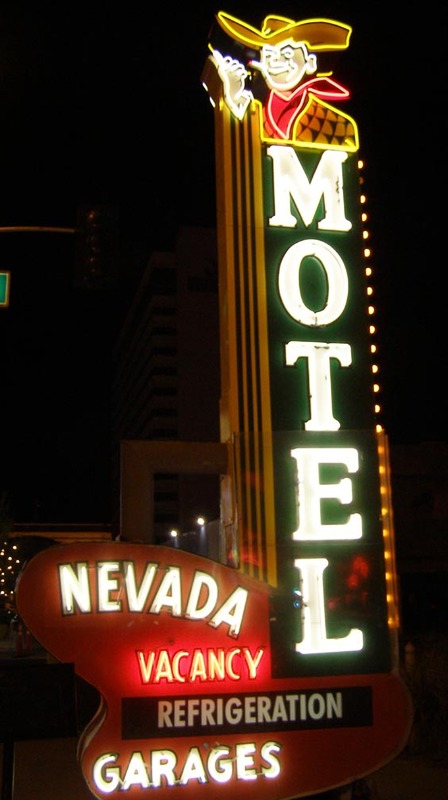 The Nevada Motel opened in 1937. This sign is from around 1950. 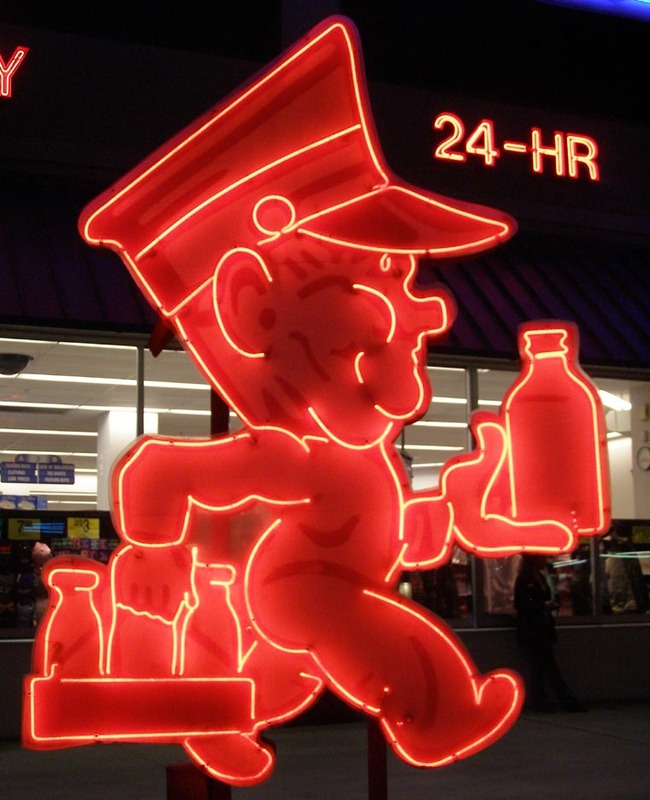 This was the first sign to depict the Vegas Vic character. The sign was restored and put on display near the Fremont Experience in 2000. After being in storage for several years, it is now on display at the Neon Museum. For more, see this website. 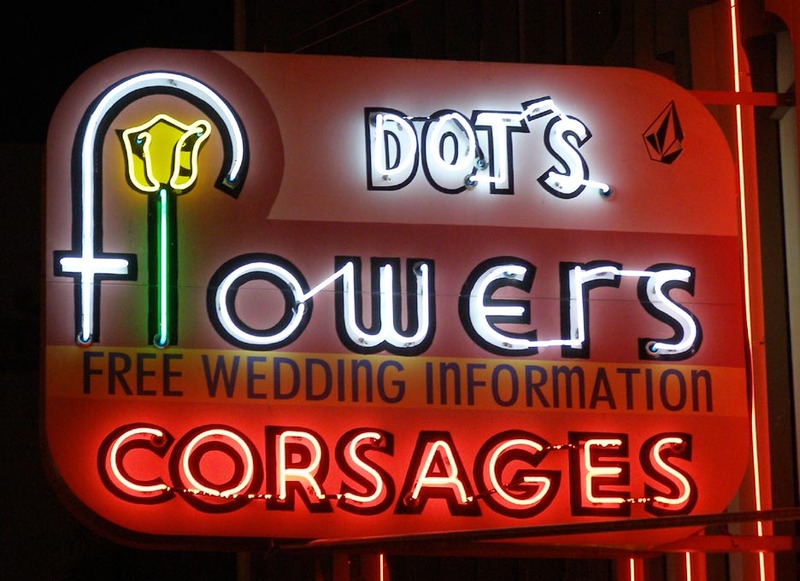 The Dot's Flowers sign was built by YESCO around 1949. It was restored and put on diplay here in 2000. For more, see these websites: 1 and 2. The Aladdin Hotel opened in 1966. 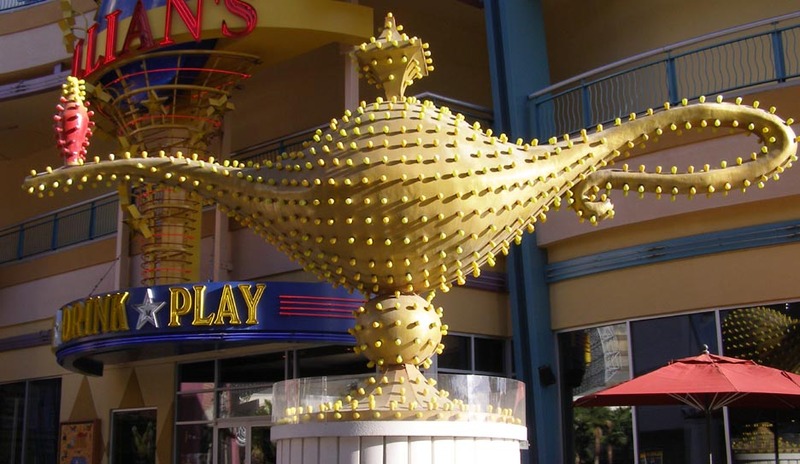 The YESCO-designed sign featured Aladdin's Lamp at the top. 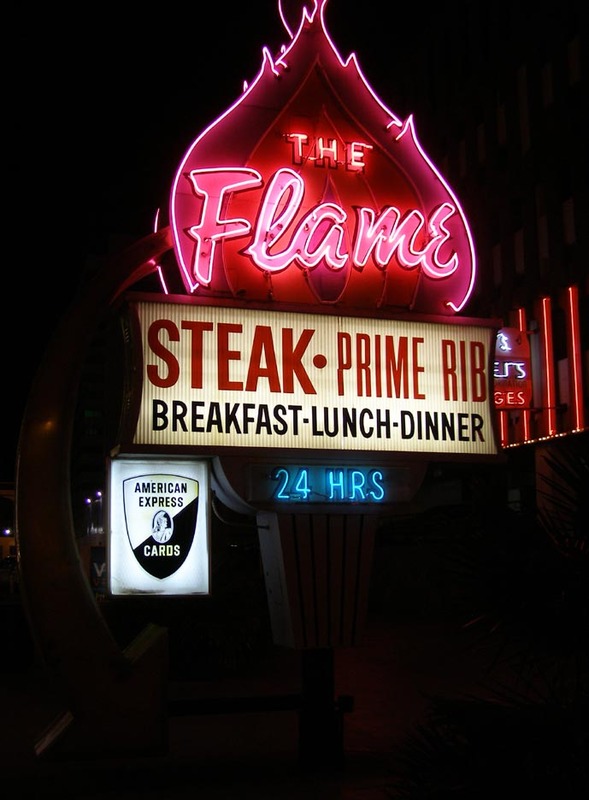 The sign was updated in the 1980s with a rectangular one that incorporated the Lamp in its design. The hotel closed in 1997 and was demolished in 1998. The Lamp was saved, restored and put on display here in 1997. 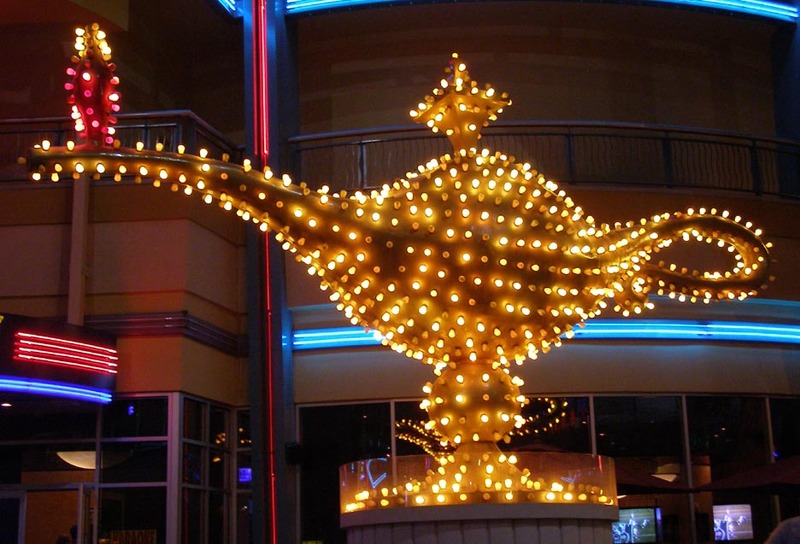 A new Aladdin Hotel opened in 2000. For more, see these websites: 1, 2, 3, and 4. 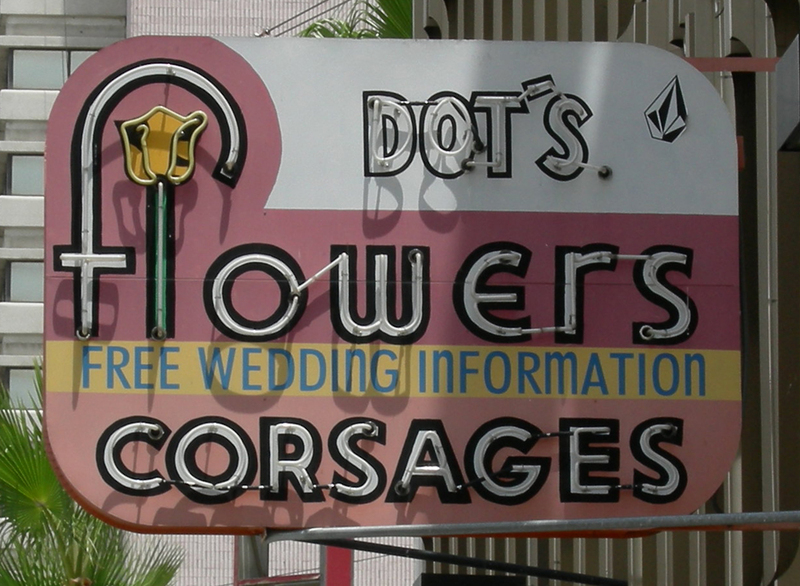 The Wedding sign was built in the mid-1940s by YESCO. It was restored and installed here in 2000. Las Vegas has been famous for quickie weddings since the late 1930s. These signs in storage belong to The Neon Museum. They were located near Cashman Center. In 2017, these signs were moved to a storage lot just south of the Museum. For more, see these websites: 1 and 2.